I am not a novice to eating roasted chestnuts. New York streets are full of chestnuts roasters during this time of the year. Peeling chestnuts from these peddlers has always been part of the pleasure of winter. While still piping hot, I would crack open these nuts and rub off the inner skin or pellicle before popping the sweet meat in my mouth. Easy, right? Then I tried to roast and peel them at home. Trawling the Internet, I found a myriad of postings for peeling chestnuts. Many recommend boiling the nuts first, before roasting and peeling. Others suggests simply boiling or using a microwave. Yet another advises freezing then boiling. All recommend peeling while they are still hot. Armed with this knowledge I decided to use the boil and roast technique. But alas, the pellicle just simply refused to be rubbed off while I almost burned my fingers. Having used up all the chestnuts, I went across the street to my local Foodtown supermarket and bought another pound of chestnuts. This time I roasted the nuts in the oven after making the requisite cross cuts. I then once again attempt to peel and remove the pellicle. Being unsuccessful once again, I turned to Martha Stewart for advice. She learned from Jacques Torres that deep frying the nuts with pellicle on in hot oil can make them easy to peel. Still, I was not successful. Frustrated, I used a paring knife to remove the pellicle by slicing off the surface of the nuts, and was left with a bowl of odd shape nuts. I took solace in the fact that there are others having the same problem as recorded on the Internet. A user on Chow Hound reported that she was so frustrated with not being able to peel her chestnuts properly she simply tossed them into her trash bin. Then last week, I found some really good-looking chestnuts in Fairway Market on Broadway. I decided to give it another try. I used the boiling then roasting technique again. Miraculously, the shell and the pellicle came off just as easily as those shown on YouTube videos. Were these fresher nuts? (I think the Chinatown nuts were very fresh looking as well.) Were they a different variety? I was not able to find any satisfactory answers to these questions. 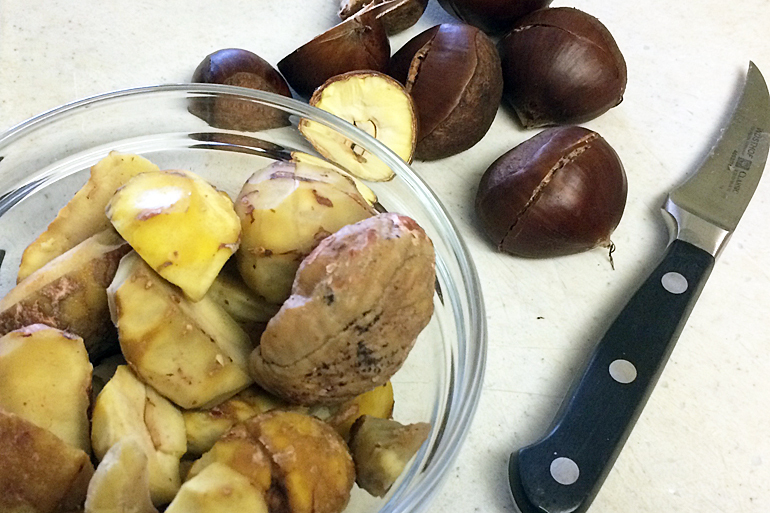 Now that I’ve peeled a bowl of chestnuts successfully, I’m ready to make use of them. I love using chestnuts in savory dishes. 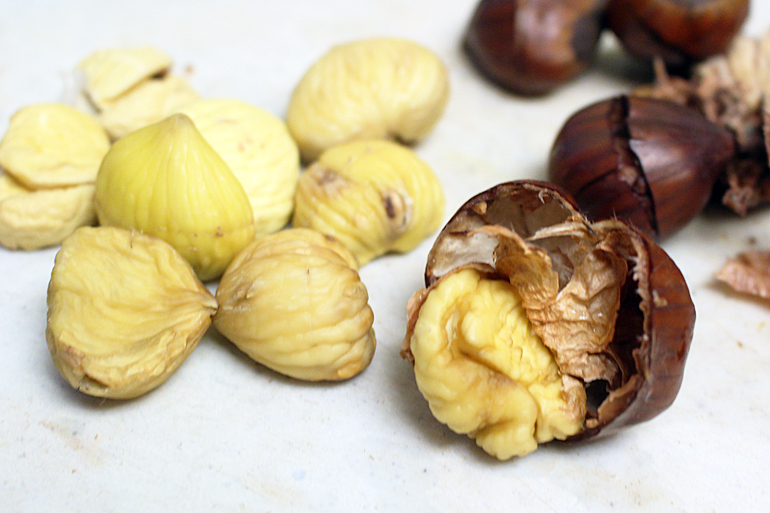 In fact, I often reconstitute dried peeled chestnuts from China to enhance braised dishes. 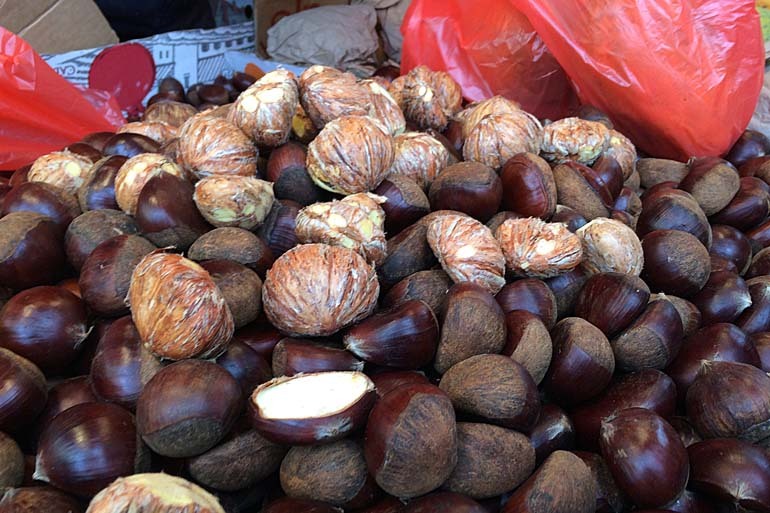 Chestnut is a common cooking ingredient throughout China. But the northeastern region near Tianjin is reputed to produce the best nuts. Hence many of the northeastern dishes utilize these sweet nuggets extensively. 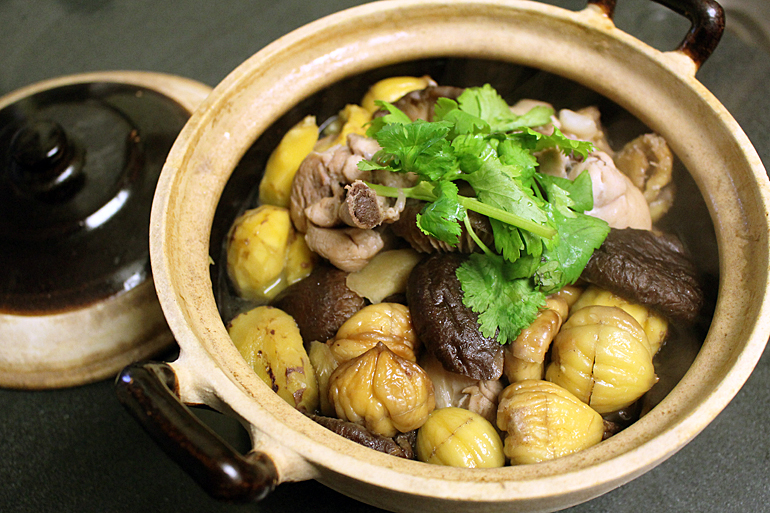 Today, I want to share a common braised chicken dish with chestnuts and shiitake mushrooms. The fragrant shiitake aroma actually enhances the subtle chestnut flavor and complements its sweetness. Merry Christmas or Happy Hanukkah to all. And if you have the answers to my two questions above do let me know. Oh and… have a Happy New Year! Put the chicken into a medium saucepan, and add enough water to cover completely. Bring the water to a boil, and then turn the heat down to medium. Gently parboil the chicken for 10 minutes, skimming off any scum that forms on top of the liquid. Drain the chicken and discard the water. Transfer the chicken to a medium clay pot or a medium Dutch oven. 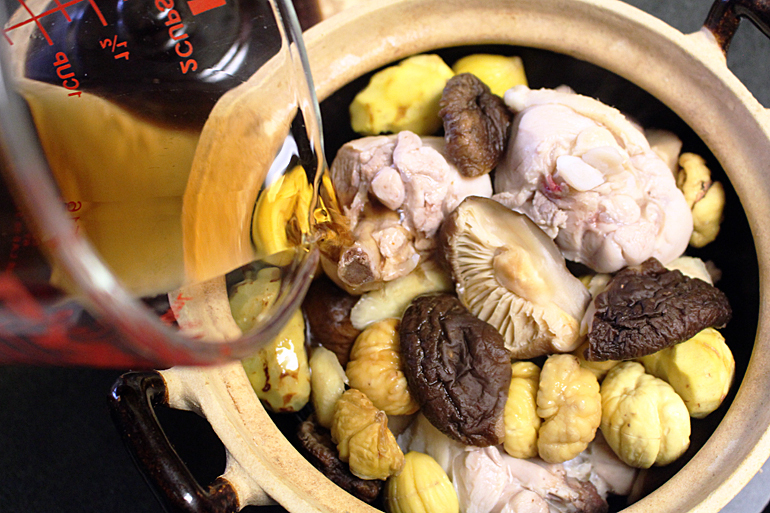 Add the chestnuts, shiitake mushrooms and the ginger to the pot and distribute them evenly among the chicken pieces. Add the Shaoxing cooking wine, soy sauce, sugar and ground white pepper to the pot. Add enough water to cover all the ingredients. Bring the liquid to a boil over high heat then turn the heat down to low and slowly simmer the ingredients. Cook for about 30 minutes or until the chicken is tender. 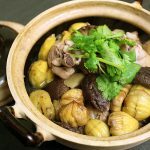 Serve the braise hot in the clay pot. Oh, thank you for wonderful tips. I watched your youtube video. This tricks was very helpful for me. I have a question on this recipe. I want to use cow’s meat instead of chicken. Is it possible? is it will be tasty? Thank you for visiting Red Cook. The mushrooms and chestnuts flavors are very delicate and subtle. So beef may not be the best choice. The stronger meat taste can overwhelm the other ingredients. Having said that, if you wish to use beef then be sure to cook it for a longer time. Perhaps for about one hour.